Wicked public policy problems have generated calls for better interdisciplinary collaboration for decades. No one discipline can effectively tackle them. Climate change is perhaps the ultimate wicked problem. The high profile that the COP21 meetings in Paris received will reinvigorate calls to break down disciplinary silos in the interests of mitigating dangerous climate change. But that won’t make silo-busting any easier. Neither academic structures nor the complexity of the problem facilitate it. But what if browser-based search engines like Google were not the only easy way to dig into climate change? What if we could access the collective knowledge of thousands of experts representing all of the disciplines that form the grist for individual, organizational, and societal climate change decision-making? This would be no mean feat. Anyone thinking seriously about geoengineering, for example, ideally would bring to the conversation an understanding of risk and risk management, economics and cost-benefit analysis, ethics and philosophy, atmospheric sciences and the functioning of complex systems, and societal decision-making and governance. While no one can be an expert in everything, what if we could easily explore and learn from work being done across all climate-relevant disciplines? What opportunities would this open up for teaching about a problem as wicked as climate change? How much better prepared could law and policy decision-makers be to tackle climate change? After more than 25 years in the climate change field, in 2010 we began to use specialized TheBrain® software to build a climate knowledge solution. We had the lofty goal of helping users find “actionable knowledge” to support climate change thinking and decision-making. The open-access Climate Web contains far more information than any individual is likely to ever want to know. There just is no one-size-fits-all “actionable knowledge” when it comes to climate change. While we have only scratched the surface of the Climate Web’s potential, we are encouraged by user feedback including “having the Climate Web available is like having 100 experts in climate science, risk, communications and corporate strategy at the decision-making table with you.” That’s exactly the kind of inter-disciplinary perspective we’re trying to promote. You can see it in action in this recent Climate Web webinar recording. 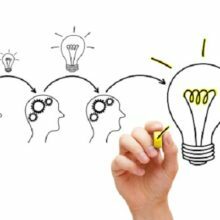 The core idea of TheBrain® software we use in the Climate Web derives from the concept of “mind maps.” Mind maps tap the organizational power of visualizing relationships of information. Their two-dimensional nature limits their capacity, however. TheBrain® software takes such visualization to a new level. It is uniquely suitable to linking together information from the wide range of disciplines relevant to understanding and responding to climate change. The Climate Web incorporates more than 11,000 reports, books, and journal articles. It is home to hundreds of PowerPoint presentations, infographics, and videos. More than 15,000 URLs point to news stories and web pages external to the Climate Web. More items are added practically every day. The Climate Web curates, organizes, and links climate change information and ideas. 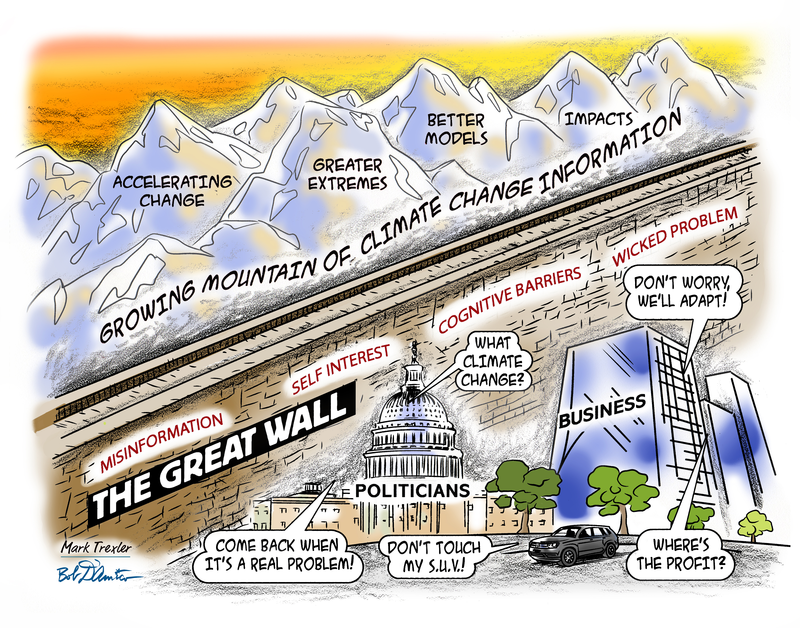 With more than 500 topic headings and 750 index terms, the Climate Web pulls together published sources, news stories, multimedia materials, Q&A, discussion points, and commonly voiced arguments. This multi-subject and multi-resource organization facilitates cross-discipline exploration. It offers a knowledge solution that supports individualized learning and interdisciplinary thinking. Instead of presenting a single point of view or advocating a particular policy or technology outcome, the Climate Web curates arguments and ideas from experts and thought-leaders across numerous disciplines. It creates a learning environment that encourages users to look at climate change through alternative disciplinary lenses. A key feature of the Climate Web is that critical visuals, ideas, and other information can be extracted from included sources and then linked throughout the Climate Web. That makes it possible, for example, to collect in one place what dozens of reports might have to say about a specific issue. It also makes it easy for users to find their way to documents and resources of which they are not aware, but that might include “actionable knowledge” they need. Consider this example: Alan Rowson’s 2013 report, A New Agenda on Climate Change, was one of the most insightful pieces of climate analysis that year. But in three years, we have found only four people who had previously heard of the report. In exploring the Climate Web, you will likely find A New Agenda on Climate Change and many other resources that might influence your climate change thinking. In the bullets below, we briefly lay out how the Climate Web can support efforts to bring more interdisciplinary and individualized learning into the climate classroom. Are Climate Risks Much More Immediate Than We Realize? Can We Overcome Communication Barriers to Addressing Climate Change? Is Economic Cost-Benefit Analysis the Right Frame for Inter-Generational Decisions? Will a Low-Carbon Transition Come Too Late to Avoid Dangerous Climate Change? Will a Successful Climate Social Movement Get Organized? Is Business Friend or Foe When it Comes to Addressing Climate Change? Will Adaptation (as Opposed to Mitigation) be Chosen as the Path of Least Resistance? These may seem like straightforward questions. But they’re not. How policy and business decision-makers think about these questions will direct national and global policy, life-and-death business decisions, and the disposition of trillions of investment dollars. The Climate Web allows students to explore these questions, access differing points of view, and hopefully challenge their own pre-existing assumptions. Was the Paris COP a success or failure? Will the Pope’s encyclical on climate change make a difference? The Climate Web organizes topical resources in ways that make it easy for a user to explore. The Climate Engineering Deep Dive, for example—one of more than 50 Climate Web Deep Dives—integrates about 300 resources. But just as importantly, users can easily jump to topics including inter-generational decision-making, risk management, decision-making under uncertainty, climate ethics, and other topics relevant to discussions of climate engineering. While the Climate Web organizes a vast amount of information, it does not seek to provide easy answers. Its structure requires thinking and user involvement. This provides exactly the kind of process that contributes to student learning and knowledge retention. Course materials can provide hyperlinks into the Climate Web, facilitating student access to exactly the information desired. Our Climate Spotlights allow a window into the Climate Web from any website to be customized to the needs of a particular class, pointing to reading and research materials specific to the class. The Climate Web can be used in the classroom to explore topics outside a professor’s specific discipline. The one-day Scenario Planning course built into the Climate Web, for example, can facilitate exploration of climate change risk scenarios; this is a key topic for corporate and policy risk managers. We undertook to build the Climate Web with the goal of helping users find “actionable knowledge” to support climate change thinking and decision-making. We believe it can help prepare students for the intensely inter-disciplinary nature of the climate change problem. We invite you to explore it for yourself. We have found from experience that the software interface is not immediately intuitive to everyone, but the learning curve is only 10-15 minutes. We have also found that the webinar referenced above (available here with full length Q&A and here in shortened form), is a big help in communicating the structure and functioning of the Climate Web. We would be interested to hear about your experience with the Climate Web. This will help us as we continue to work with the Climate Web to help tame the wicked problem of climate change. Originally posted on American University’s Teaching Climate/Energy Law & Policy blog on 2/5/2016. We Have Met the Enemy And . . . Wait, Remind Me?